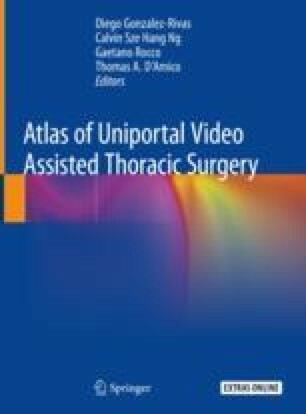 We previously developed a surgical technique called subxiphoid single-port thymectomy to excise the thymus through a single opening made below the xiphoid process. This procedure is facilitated by creating adequate space for surgery by inducing compression of bilateral lungs and the mediastinum by means of CO2 insufflation. We previously reported a comparative study of the early outcomes after VATS thymectomy and single-port thymectomy performed at our hospital from January 2005 to December 2014. Subxiphoid single-port thymectomy takes the same amount of operative time as VATS thymectomy via a lateral thoracic approach, but results in less blood loss and enables earlier termination of postoperative analgesics. This method offers an excellent cosmetic outcome with just one 3-cm incision in the abdomen and is the most minimally invasive form of thymectomy that avoids sternotomy and intercostal nerve injury. Investigation of the safety of this procedure and long-term therapeutic outcomes for myasthenia gravis and anterior mediastinal tumors is necessary. The online version of this chapter ( https://doi.org/10.1007/978-981-13-2604-2_11) contains supplementary material, which is available to authorized users.